Summary: In this 2007 interview published in Nintendo Dream, scenario writer Takumi Shū, producer Matsukawa Minae and character designer Nuri Kazuya talk about Gyakuten Saiban 4 (Ace Attorney 4 – Apollo Justice). The three worked previously together on Gyakuten Saiban Yomigaeru Gyakuten (Ace Attorney DS). Gyakuten Saiban 4 was to be a new chapter in the series, featuring a new protagonist. In this interview, the three talk about the atmosphere in the game and the troubles they had with writing the story and designing the characters for this new, but familiar-looking entry of the series. Interviewer: Before I played the game, I thought this game would be completely different because it was called a new chapter, but now I’ve played it, I have to say it was more like Gyakuten Saiban (Ace Attorney) than I had first expected. Nuri: The first episode in this game is already like the final episode in previous games (laugh). Interviewer: We can’t spoil the story here, but it’s a thrilling ride, and the game pulls you in right from the start. Takumi: I’m happy, or dare I even say relieved to hear that. In the end, it was me that wrote the whole scenario, but early on in the development cycle, we actually talked about whether it shouldn’t be someone else writing this game because it was a new chapter. Because I'd be the one writing the game, my love for the old series and the characters would come out naturally. But the game was to be a new chapter about a new protagonist, so it was to be like a reset of the whole series. You see Naruhodo appearing this big on the main visual we’ve released now, but I think he’s there because of me. Interviewer: To tell you my honest opinion: it’s the world of Gyakuten Saiban I know, but it’s new. It felt fresh, like I was playing the series for the first time again. The in-game movies too felt more mystery-like than ever before. Matsukawa: (While staring at the two) Anyway, I also want people who have played the series until now to experience 4 as a new, fresh game. Interviewer: So that is why it feels like a completely original title, even though it’s the latest game in the Gyakuten Saiban series. Nuri: (Satisfied expression) Just as planned. Interviewer: Naruhodo appears in the first episode already, and I had first expected him to be Odoroki (Apollo Justice)’s senior. Who would’ve guessed he’d actually appear like that! Takumi: One of the biggest points I had to think about was how Naruhodo was to appear in the game. I had him appear in the game like that because when I imagined Naruhodo seven years later, as a veteran attorney… it was just boring. That’s why I immediately came up with that dark image. It was Nuri’s design which gave form to that aura of his. Nuri: We decided just like that on the design. Mr. Takumi first asked for a design where you wouldn’t notice it’d be Naruhodo. Later, he only added extra comments to make him look even worse. The look I gave him even had me worried about whether I wasn’t going too far. Interviewer: So he told you to make him look more shabby? Takumi: I wanted to change him so much you wouldn’t know who he was. But we started promoting the game last fall, and it was written in all the magazines that it was Naruhodo. It would be real surprise if you could play the game without knowing it was him. We’re in an internet community now, and once something is out, it spreads immediately. So I didn’t really want to reveal that. I wonder how many people who loved the first three games, played 4 without any prior knowledge? Someone who had been unconscious during the time we released all the information about 4 might have the most fun with the game (laugh). Interviewer: The new protagonist, Odoroki, is a pretty unique character. Takumi: Odoroki does his job whenever the job calls for him, but he still has a childish, inexperienced side to him and that differentiates him from Naruhodo. But I had quite a lot of trouble differentiating the two characters, also in design. Nuri: Naruhodo has the series history, so Odoroki feels out of place if you put them next to each other. He’s a new character, so nobody knows him yet, and I wasn’t sure whether he’d be a good protagonist. As for the form of Odoroki’s face, I took some elements from Naruhodo on purpose and really paid attention so he wouldn’t look weird in the eyes of the users. He is a protagonist who has some similarities with Naruhodo, but is in a different vector, so I hope people can get used to him quickly as they play the game. Matsukawa: Players project themselves on the protagonists in the Gyakuten Saiban games, but they are characters on their own too. I think these two did a great job at getting that balance. Takumi: This happens to me every time, but the theme of 4 was to be a completely new Gyakuten Saiban, and now it’s finished, I have to say it has become something I hadn’t expected, something different from what I had imagined. Like we just said, it’s become more something like a fusion between the old and the new, so I might have failed with the original theme of this game, but it has turned into something else that is good too. When I wrote the scenario, I came up with very different ideas than I had originally planned, in a good way. Interviewer: So it changed for the better? Takumi: If you add “in a good way”, everything sounds better (laugh). But I myself, as the writer, am surprised that Odoroki turned out the way he did. So there was little that went according to plans. I only followed the broad lines we had decided on early on. Interviewer: Akane (Ema) also changed a lot, but she did become a police detective. Nuri: In Yomigaeru Gyakuten, Akane was in a similar role like Minuki in this game, so if we had her appear like that again, their roles would overlap. So I also had to change her design like that. Takumi: The game is set seven years after 3, and I couldn’t imagine Itonoko (Gumshoe), with some gray in his hair, explaining about scientific investigation…(laugh). Nuri: And Odoroki’s boss is also a man. So he’d surrounded by all these men. Takumi: But is Garyū (Kristoph Gavin) really a man? Nuri: He has large fingers! If it really had turned like that, I’d really have been angry. You need to tell me these things early on! Takumi: And at the end, he’d say: “Polly, let’s go, dear!” (laugh) By the way, Akane also changed a lot while I was writing the scenario. I changed that in the final version of the game, but in the original version of the scenario, she was like two completely different persons in episode 2 and 3. Nuri: She is not someone who’d have something like that happen to her. Matsukawa: It was a surprise to me. To have Akane appear as such an edgy character. Interviewer: The prosecutors are important characters in Gyakuten Saiban. What kind of guy is the rockstar prosecutor Kyōya (Klavier Gavin)? Nuri: I drew him, but to be honest, I still don’t really know him. But someone who test-played the game said he was a good guy (laugh). Takumi: He’s a good guy. Matsukawa: Yes. I cried for him. Matsukawa: We decided on his character one year ago, but I never could’ve guessed he’d turn out like that. Takumi: Yes, Kyōya was a difficult character too. Perhaps I don’t really know him that well either. He has a lot of sides to him. I can’t talk about it here because it’d spoil the game, but for example, there’s his band. Matsukawa & Nuri: Garyū Wave (The Gavinners). Takumi: I came up with that without really thinking it through, so I was afraid Nuri would get angry if I told him about that. Matsukawa: Like the titles of his songs. I can’t talk about the details, but we thought Nuri’d get angry if he heard the title. And the sound designer was also sure to get angry if he found out what the lyrics were to that cool song. Interviewer: Where did you get the idea for him being a rock star? Takumi: Nowhere in particular (laugh). You need something interesting to write a character. Minuki was the magician so after some thinking, I arrived at the rock star. Matsukawa: At first, he was just wearing rock clothing. Nuri: He wasn’t a musician at first. That was when we had a face design, but not the story yet, and I asked Mr. Takumi whether he’d give him some background and he said rock star. Takumi: I was just joking then. Nuri: So I tried some designs. I bought three expensive books for references. I was afraid I’d be buying them for nothing. Matsukawa: There were a lot of books on Nuri’s desk with silver accessories, so I asked him about them, and he told me that Mr. Takumi had told him to give Kyōya something jingling. Nuri: And now I look back, and it turns out I didn’t need all that reference material. It’s just a pendant in the form of a G that is too big (laugh). Takumi: I think that Nuri’s favorites for this game are the Garyū brothers? I have the feeling he spend a lot of time on them. Nuri: I don’t have any particular favorites. I love all of them. I spend a lot of time on the brothers because I had a lot of trouble with them. Takumi: They are handsome male characters, so they have gathered a lot of popularity even before the game was released. I wonder whether the brothers will gain fans if people play the game, or lose fans. Nuri: I have no idea (laugh). Matsukawa: About Kyōya…we have Mitsurugi (Miles Edgeworth) in the Gyakuten Saiban series, right? I said once that if we wanted someone to surpass him, we needed to approach it from a different angle. But once the character was decided on, I realized none of my ideas were reflected in his design!! Nuri: I just did what I was told to do!! Matsukawa: But it’s become a good design, different from what the initial order was. Takumi: He has a cool look, so it’s better for him to not make strange remarks. Nuri: He is different from the other characters in the series until now. Matsukawa: Yes, he’s someone who we had not seen before. Takumi: It’s more like he slipped away (laugh). But Kyōya is a character difficult to categorize. It’s hard to describe him. Matsukawa: You mean there is no clear meaning to him? Takumi: The whole world around him is perhaps without a clear meaning. It’s something we could do only in 4. Nuri is better at serious designs. Godot and Mitsurugi were designed after the scenario was decided on, but Mei (Franziska von Karma), her personality changed after her design was decided. Kyōya also changed a lot when his design was decided on and I came up with the rock star idea. Like with the scenario, my expectations and the actual output differed. It’s weird. Nuri: It all came together in unexpected ways. Matsukawa: But he’s even more unique than the way we talk about him here. If everyone will play the game and meet him for yourselves, you might understand what we mean here (laugh). Interviewer: You appear to have had troubles with the scenario and characters, but did you also have difficulties elsewhere? Takumi: It is a new chapter, so we needed a new mechanic, but it was quite difficult coming up with the Perceive system. Interviewer: You perceive the shock of witnesses through their gestures and mannerisms. It’s like a psychological fight, and fun. Nuri: We had fights about how big those gestures needed to be. Takumi: It’d be too obvious if the gestures were too big (laugh). We also had talks about the graphics of the eye whenever you use Perceive. Matsukawa: We had some that actually made you feel physically sick (laugh). Interviewer: Odoroki’s bracelet is connected to the powers of Perceive. I think I heard you had the design of the bracelet first, and later added it in the scenario? Takumi: Yes. Nuri came asking me what the meaning of that bracelet was. Nuri: You need to have some meaning to it (laugh). Takumi: He looked very seriously at me then, so I quickly came up with something. I look at Gyakuten Saiban as mystery fiction, so these psychological element we ended up with worked great to give it all some extra flavor. But I wonder how it is for the others? I guess Nuri first thinks of the characters? Nuri: Yes, I want to know how the characters are portrayed. Takumi: Like getting surprised about the personality of a character, or getting sad when a character is not used. Nuri: Yeah, that happens a lot. Takumi: While writing the scenario, it sometimes happens the personality of a character changes, which makes them difficult to use in the story. Matsukawa: I hope that both people who are looking forward to Gyakuten Saiban, and people who don’t know the series yet, will pick the game up in the stores. Takumi: The development circumstances have changed and the game features a slightly different world now. It was not easy, but the whole team worked on this, and it’s become a game I am happy with, knowing this is a game only this team could’ve made. Please try it out. Nuri: In terms of characters, we went for characters not seen before in the series on purpose. But we also have characters that fit well in the older Gyakuten Saiban world which fans will be happy with. I think we have a good balanced set of characters. I’d be happy if you’d look forward to the game. While I think it's a good game, I also think that GS4 is the weakest entry in the series. I tried this game twice in my life, and I just can't find the charm the other entries have. Apollo it's just a weak character in his own game. The majority of the characters are... unappealing (Excluding Trucy and Kristoph). It's kind of sad to read (for me) that they changed Phoenix that much only because Takumi thinks "he would be boring" otherwise. But, even then, I think it wasn't handled correctly. They also talk about how hard is to define Klavier and I see why: I also have trouble with it. It's a good character, but weaker that every other rival. 4-2 is an... okay episode, but 4-3 is the weakest of the series, in my opinion. It's bad. Bad story, pacing, characters, mystery even development. And the big finale is simply not that good. Apollo Justice is probably the most debatable game in the AA universe and having this long interview is a great source. Thank you very much! 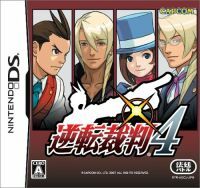 I admit AA4 can be quite different, but I really loved 4-2's whimsical approach, free structure and great use of all the new ideas (3D presentation, Perceive, etc.) and as a fan of Japanese mystery fiction, I also like Takumi's take on a classic trope in 4-3 (I won't say it's the best case ever, but I never disliked this case as many others do).